I got Kess from the local pound when she was about 7 months old. She had been picked up as a stray and was scheduled to be euthanized because she was deemed "un-adoptable". Why was that? Because she was a Border Collie! The people who ran the pound knew all too well that this breed can be quite challenging, and decided to euthanize rather than go through the trouble of finding the right home. Fortunately one of the technicians thought Kess was too sweet to die young and looked high and low for someone to take her. A friend of a friend of a friend gave her my number and early the morning she was scheduled to die, Kess was slipped out the back door of the pound and into my car. Right off the bat I knew this dog was special. Whip smart and desperate to please, she was very keen to learn everything and anything I had to teach. She also worried a lot about being wrong, and was very sensitive to anything she perceived as a correction. Like me stubbing my toe and cursing. Despite being so smart, or rather because of it, Kess - like many of her breed - has been a challenge to train. These dogs think so fast they often end up a few steps ahead of us, doing their best to guess at what we want and not always getting it right. They can also teach themselves a lot of things we're rather they did not know! I do both agility and sheepherding and Kess has proven herself quite brilliant at both. In particularly she's a spectacular sheepdog, probably the best I've worked with. She is a really outstanding example of her breed, and it's amazing that she ended up in a shelter and almost put down. Amazing, but not surprising. Dogs like this are not for everyone. In fact, I'd say they aren't for most people. 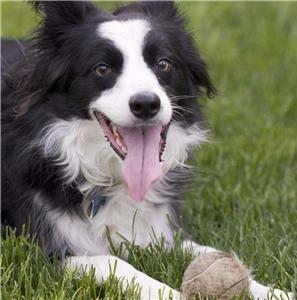 I run and exercise my border collies a minimum of one hour a day, off-leash. I also train them in two sports and we work on these five days a week. When I have time to do more, I do. They're always up for it. More than physical exercise, the Border Collie needs mental stimulation. Without it they develop all sorts of obsessive behaviours, ranging from herding cats to chasing clouds and shadows. I've done a lot of rescue work over the years and the number of yards I've been in with deeply worn "tracks", worn by the repetitive running patterns of a neglected backyard Border Collie, is heart breaking. Kess got lucky. Bred to work, she was sold to a young family that was unable to meet her needs. Before she was even a year old she wound up in the pound and scheduled to die. She got out in the nick of time, and now lives and works full-time on a sheep farm. Too many of this breed don't have such happy endings.